We are on the last leg of our journey to Virginia Beach. If all goes as planned by our trusty Magellan GPS, we should be there in less than 3 hours. Yesterday, we were high in the Smoky Mountains, in God's Cathedral, listening to praise music and worshipping the Creator of all this beauty. We saw deer and wild turkeys and a fox, and even a glimpse of a brown bear up on a mountainside amidst the trees. We went over the Newfound Gap on icy,snowy roads, and entered the North Carolina side of the park. We stayed several hours at Wendy's cozy little house, reminiscing and sharing our stories with each other. Wendy had hosted Joey and Rachel in her home in New York two years ago, when they were traveling across the US. We cried together and we sat amazed again at how God has woven our lives together thru the good times and the struggles. What a treasure to have friends who know you thru and thru and love you still. We ate breakfast in our hotel restaurant, coincidentally called Joseph's Restaurant. Another poignant reminder of the son we love and miss so much. Seeing his name just reminds us of what an amazing person he was (and is) and that our lives are so much richer for having had him. 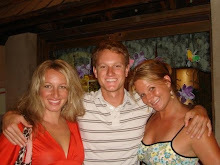 Even if we had known we would lose his presence at age 28, we still would have chosen the privilege of raising him, and every minute and every dollar we spent on him. What an awesome man he was to all of us who knew and loved him, and someday we will meet again. The Christmas lights were beautiful at this hotel in Nashville, TN. It's a cool place. The Grand Ole Opry is right next door and country music plays 24 hours a day. We went to lunch before leaving and met Chelie, our good-natured waitress. When Joe asked her how she was doing today, she replied: "I'm good and I'm blessed." Joe was having a rough day, missing Joey a lot, and feeling really discouraged. He asked her how she was blessed, because he needed to hear that. She was a little taken aback, and stammered out a response to the effect that no matter what happens in her life she is blessed. A few minutes later, she returned to our table with the water and explained herself further. She said she always says the same thing--"I am good and I am blessed" when people ask her how she is, because she feels God takes good care of her thru good and bad, and she wants to honor Him no matter what is going on in her life. She said Joe was the first person who had ever asked her how she was blessed. She went on to say that she had her problems and that even today she had no home to go to when her work day ended. She was a single mom of five, and had given notice on their place because it was not a safe place to raise her kids. She didn't have enough money for her first and last month's rent in a new place, but she knew she had to get her kids out and was just trusting that God knew and would take care of them. She said miracles happen every day. Joe told her about losing our son 6 months ago and his deep grief over that. She listened compassionately and then told him she had lost her own mother not long ago and understood the feelings of loss. She told us about her children, and that she was really proud of them because they live very simply, but never complain about it. They don't even have a car, choosing instead to walk to the market, and hitch a ride to work with friends to save that expense. Her oldest daughter had just finished boot camp with the Air Force. She was very content with her life...all she needed was a home for her kids. She knew God was going to meet that need for them and she didn't know how but she was just going to trust Him for it. Her peace was contagious, and her faith was encouraging. The more she talked about her faith and trust despite her circumstances, the more encouraged we got. As she walked away, Joe and I looked at each other and instantly knew what we were going to do....and we did exactly what you would do if you were given the opportunity! Her joy spread to us, and we left with smiles on our faces, having received our own little miracle for the day. It's not for everybody! One couple we met while traveling told us not to waste our time. But if you have ever been all shook up, loved someone tender, or rushed in like a fool, then Graceland is for you!!! It is SPECTACULAR. It is the most visited house in America, now exceeding the White House. It consists of the white-columned colonial home that Elvis bought when he was 22, the 20 acre grounds, the trophy room packed with gold records and gold-studded suits, and the meditation garden where he is buried next to his parents. We loved every minute of it! What comes out loud and clear is that Elvis loved his mama and daddy, his little girl Lisa Marie, his country and the Lord. He also had more talent and money than he knew what to do with, and too many people living off of his good nature. The final song on the video playing in the trophy room is a very moving rendition of "All My Trials, Lord, Soon Be Over", then you meander over to the meditation garden where his eternal flame flickers on. His tomb is surrounded by flowers and gifts, which arrive every single day from fans all over the world. It left us with the sense that his trials are indeed over, that he lives on in a better place, that he's at peace in the presence of the Lord. It made us wonder if Joey has run into him yet, up there in Heaven. Here's what awaited us after 24 hours of gracious Southern living: a perfectly flat tire. Duct tape won't work on this one! AAA comes to the rescue! Don't leave home without it! Our schedule is thrown off- I guess we won't be able to spray graffiti expletives on the Bill Clinton Library today! the headlamp! Yankee ingenuity, for sure! Gunther marches on! Inside the van, all of Joey's things from his house in LA--surfboard, golf clubs, snowboard, and his green chair--- all too precious to part with. They will find a new home in VA.
Whoever told you the south was full of rednecks and hillbillies hasn'tbeen to Little Rock. This hotel is beautiful, and the ducks are the main attraction. They bring them out of the Duck Palace, every morning at 11am and march them thru the lobby on a red carpet accompanied by John Philip Souza music. The ducks walk up the little stairs and jump into the fountain, where they swim till 5 pm. Then the whole spectacle is reversed and they return to their palace for the night! These pictures are from the Oklahoma City National Memorial. It was built in honor of those who died during the attack on the Murrah Federal Building in 1995. It was a beautiful and moving memorial place, laid out in the exact place where the building once stood. The reflecting pond now stretches out where the road used to be in front of the building. The bronze chair sculptures are for the 168 people who died from the explosion, 19 of whom were innocent children who were in the daycare facility at the time. The fence outside the memorial is covered with stuffed animals and toys and pictures, all placed by visitors to the site. The graffiti on the wall, demanding justice for the victims, was written by a first responder on the day of the terror act. The statue of Jesus weeping is on the corner across the street from the site, placed there by a church, with the inscription, "And Jesus Wept". The beautiful golden tree surrounded by the rock wall survived the explosion because it's roots were deep. There's a lesson there for all of us. Today is the 6 month mark since Joey's departure to Heaven. We try not to say, "since Joey died" anymore. Some would say that's a euphemism, a form of denial, and a sugar-coat of the facts, and I guess that's partly true. The word "death" has become a painful word that we don't like to use anymore. It's jarring, and dark and final and hopeless. Painful. We need more than those hard words to get by..
Our progress in dealing with the loss of Joey is determined by one thing---our hope in a place called Heaven. We have found that focussing on God's promises is the ONLY way out. God's words about Heaven, eternal life, our blessed hope---those are the words that heal and strengthen. The past six months have been hard work---a difficult climb out of a deep pit of crushing loss and disappointment. So when we talk about Joey's departure to Heaven, it is a statement of faith on our part...a declaration that there is more than meets the eye in our loss. Though Joey is no longer here on earth, and that's the hard part, he is still nonetheless very much alive. He is in Paradise. He is experiencing the joy of being in the presence of God, and the pleasures at His right hand. His time in the courts of Heaven have been better than thousands of days anywhere else. He sees God and the saints and the angels and is also watching the spiritual battle on earth, which is far more gripping than the best movie he could ever see at the Cinerama Dome in LA. He is hearing music and making music in a whole new way, creating with some of the finest musicians ever known. He is talking with some of the finest minds in history--poets, writers, thinkers---people he read about and admired while on earth. He is praying for those he loves---his grandpa and his mom and dad, and his sisters and brothers-in-law, and his beloved nieces and nephews, and precious Rachel. We can almost here him cheering us on to keep the faith....trust...believe. So for the past six months, day by day, layer by layer, we have been adding to our storehouse of promises. We are creating a rich view of Heaven, based on God's word, so that we can bear the absence of our Joey. And God is working hope in us, so that we are comforted that this is a temporary loss. And for now, Joey is enjoying and exploring Heaven, and as we wait for the moment of reunion, he too is waiting for us to arrive. 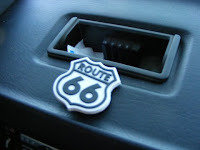 Get Your Kicks on Route 66 - Part 3 of the "A Sentimental Journey"
Route 66 was the original interstate highway. Stretching between LA and Chicago, it was the only way to get across country before the 60's and the advent of the interstate highway system we use now. Route 66 had a culture all its own with snappy service stations, refreshing soda fountains and teepee-shaped motor hotels springing up all along its 1600 miles. Joe and I both remember it well from our childhoods in southern California. As we travel along I-40, which stretches from coast-to-coast, we are running parallel with the old Route 66, and it runs for miles right next to the interstate. We've been surprised that many of the towns we are stopping in have a designated "Historic Area" devoted to Route 66 and it's small businesses reminiscent of the 50's. That makes us feel real-l-l-ly old...our history is now "Historic"! The signmakers are obviously too young to know better. The thing about Route 66 is this--in spite of its promise to give us our kicks, there really ain't much going on. Especially across the Great Plains fo the US. I keep checking the AAA guidebooks for POI's (for the uninitiated, that means points of interest) and have yet to find anything worth stopping for. 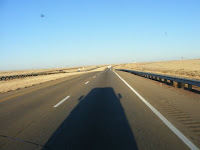 So we are driving on and on and on....trying to make our 500 miles to Oklahoma City by midnight. Keep your fingers crossed! On a happy note, Albuquerque is a pretty charming place. We visited the oldest church in Albuquerque (1703) and found it peaceful and soothing. At the store attached to the convent, we found a beautiful iron cross to go near Joey's memorial tree in JoAnne's backyard. We found crosses for everyone in our family...small reminders of our hope in Heaven. We left Maui last Sunday intending to visit LA area friends and family, then pack up Gunther and leave. Gunther had been in storage at Rocky and Doreen Liuzzi's storage facility in Temecula for the past 6 months, cozy and safe, but not moving! And now we were wondering if he could even make the journey! So in a flash of inspiration, Joe contacted Lloyd and Renee Mize...dear old friends from our CA church who lived near the storage facility. They were immediately responsive...Lloyd had dreamed about Joe the night before! It was a sign! They offered to do whatever we needed. Joe asked Lloyd if he could get Gunther out of storage, and as an experienced RV afficionado, test-drive Gunther and give us the verdict on his road-worthiness. Lloyd, who has plenty to do running his own life and business, put us first and graciously agreed to do it all. Unfortunately the Mighty Road Warrior failed the test. Six months in mothballs and he had lost his edge. What to do now? Lloyd came to the rescue. He found Scott of Quality Automotive in Temecula, the finest auto mechanic in Southern California, and told him our story. Scott learned about Joey and Rachel, and Gunther's legendary travels, and our quest to imitate a small portion of that journey in honor of Joey. Scott accepted the challenge, knowing our short time frame to get it done, and went to work. Parts were ordered and Gunther was up on the rack before we could say "Master Card". Scott had 24 hours to get Gunther rolling, and he pulled it off in style. He got us our smog check so we could register him, and even ran Gunther thru the carwash before we got there to pick him up. Now Gunther hums, he sings, he's purring like a kitten...he is the happiest thing on 4 wheels. Just like a character out of the "Cars" movie, he seems to have a big smile on his face, and enjoying nothing more than rolling down the highway! Thanks Scott...you and your awesome crew made it happen! So we owe a lot to the people who have come beside us to support our quest. The Liuzzi's for their endless generosity and use of their storage facility, Lloyd and Renee, who took Gunther out of storage, found Scott, and enlisted his enthusiastic support, and then fed and pampered us out on their beautiful ranch in Anza, while we waited. And Scott, who could have told Lloyd he was too busy to deal with a 21 year old VW van, instead threw all of his skill and his whole heart into the effort and gave us a fine-tuned machine. Because of their generous efforts, I am writing this from the Grand Canyon where we spent a beautiful day and a half reliving a segment of Joey's journey. We got up for the sunrise this morning and spread some of Joey's ashes into the deep and beautiful canyon. We miss you son and hope you are enjoying our Sentimental Journey, and all of our friends who have made it possible. 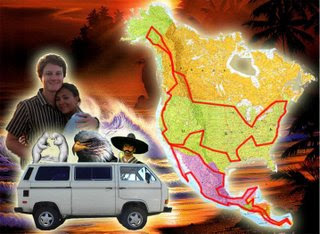 We are taking Joey's VW van, affectionately known as Gunther, cross-country to our grandchildren in VA. It's a nifty and nimble vehicle. It's got a stove, a frig, and a table. The roof pops up and it sleeps a family of 4 plus little Aidan. We could have shipped it for cheaper, but we wanted to experience a bit of what Joey experienced the last year of his life-- as he and Rachel drove the northern hemisphere, from Alaska to the Panama Canal, from west coast to east coast and back again. They logged 27,000 miles. We are doing a mere 12% of that, 3000 miles from LA to Virginia Beach (in 8 days). We wanted to share some of his zest for life and his beautiful and spontaneous spirit of adventure. 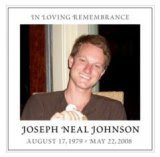 We wanted to have some time to reflect and honor our son as we journey together, listening to music, and talking about the adventure of life, and our new chapter with Joey in Heaven. This morning, after Joe's impressive all night drive, we are in Kingman Arizona, just over the state line, filling up Gunther's tank and our's, at a gas station with the world's cleanest bathroom (thank you God for road trip mercies!) We slept in the pop-up last night, which was very cool and adventurous for us!! We woke up with frozen toes, but well-rested. We are now 4 hours away from the Grand Canyon, where we will be spending the next 24 hours. On our next post, we'll tell you about what happened in LA before we started the trip....cuz it was a series of divine appointments and special moments---confirmation that this trip was the right thing for us to do! Joe and Karen in the Gunther Machine!